Daniel Smith of Rachel NV, a two-year resident wanted to do something for his community. He saw that Rachel did not have any type of fire department or even a fire truck. Through his travels he found a fire truck and contacted the owner, Ronald Kozak, Fire Chief of the Eagle Valley Volunteer Fire Department. Hearing that we did not have a fire department or fire truck, here in Rachel, Ron gladly donated his "American La France" Fire Truck, to our community. The truck was in Cedar City Utah, and Daniel Smith arranged and paid for the transport and delivery of the Fire Truck, which arrived July 17th. On Saturday July 27th Ronald Kozak came out to Rachel and met with Daniel Smith, his wife Vickie and Jim and Kaye Medlin. Ronald went over all the necessary requirements needed to start the Volunteer Fire Department, and offered his services if needed. Jim and Kaye Medlin will be organizing the fire department, and volunteers. 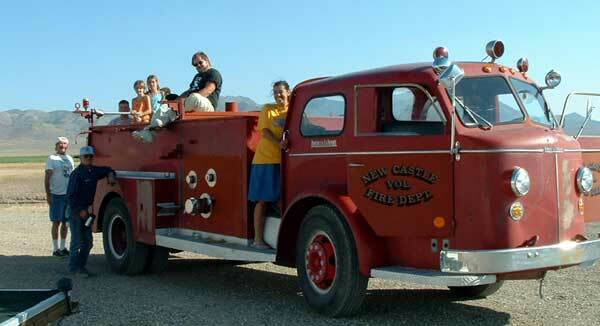 Volunteers will be trained and certified by either the Alamo Fire Department or the Tonopah Fire Department. The free training of volunteers will take place here in Rachel. During the next week, after Ron's visit, Daniel Smith and Jim Medlin worked on the truck and got it in running condition. Then on Sunday evening August 4th Daniel & Jim took the fire truck on a fire brigade. They picked up the children, and Devin with his dog Tom, and drove by all the homes in Rachel and the farms. Everyone was thrilled to see the fire truck, and lots of pictures were taken. Ronald Kozak, of Eagle Valley, who donated the fire truck, is also a member of the Lincoln County Search and Rescue Team, and is a retired Police Officer from the North Las Vegas Police Department. Ronald Kozak is currently running for the Office of Lincoln County Sheriff. 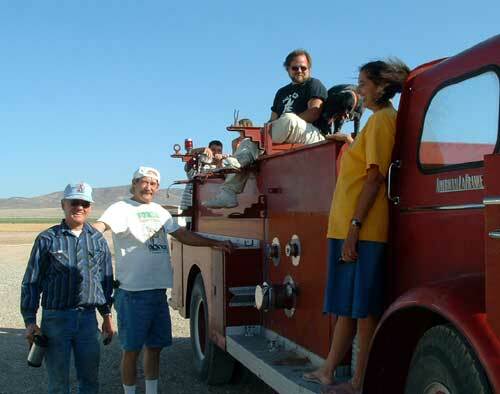 Thank you Ronald Kozak, Daniel Smith and Jim & Kaye Medlin, for making the Rachel, NV Volunteer Fire Department possible. Jim Medlin, Dan Smith, Devin Loving and Vickie Smith with the new Rachel Fire Truck. Photos by Penny Clabaugh, with friendly permission.